The Roosters went to third on the NRL ladder after their 32-16 defeat of the Dragons on Sunday, in a performance Robinson claimed was their best of the year so far. Crucially, their new-look attack which attracted so much criticism at the start of the season is now beginning to click – best exhibited by the way James Tedesco and Cooper Cronk combined to score in Sunday’s win. Latrell Mitchell is also firing, having scored five tries of his own in the past fortnight, with Roosters players noticing a difference in their star centre since he returned form his first State of Origin series. But with the finals nearing, Robinson is far from content. “I don’t think that was a complete performance, I think we’ve got a fair bit to go on what we produce,” Robinson said. “We’re getting better. But we’re still looking at a lot of that. A lot of players are coming in happy we won but not content with what we’re seeing. At the top of Robinson’s list is his team’s defence. 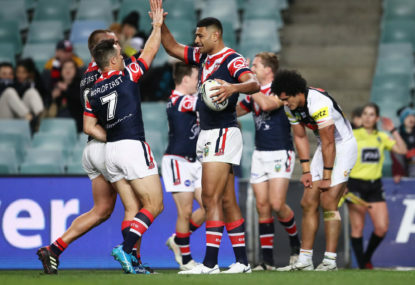 Still ranked the best in the league without ball in hand, the Roosters have let in seven tries in the past two games – albeit only one of those was scored when the match was still on the line. And while Robinson was far from concerned, he still wanted a marked improvement starting with next Saturday night’s date with North Queensland at Allianz Stadium. “I just know who we are and what our DNA is. I see guys working hard but we defend with heart and I want to see more heart,” Robinson said. “Defence is a system. Everyone has their system. Our guys show it, they work hard. They save tries. “They do it with heart and it’s got a heartbeat. Half of our game doesn’t look at it that way but some of us do. “They strangled them in defence today, but we didn’t strangle them enough for what we want to do.